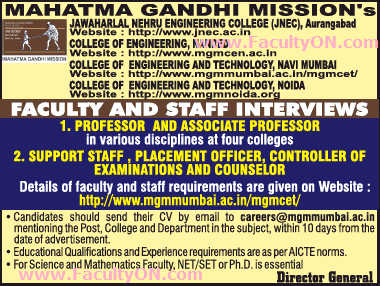 MGM's Jawaharlal Nehru Engineering College, Aurangabad has advertised in THE TIMES OF INDIA newspaper for recruitment of Teaching Faculty- Professor / Associate Professor / Assistant Professor Plus Non-Faculty jobs vacancies. Interested and eligible job aspirants are requested to apply within 10 days from 30th May 2018. Check out further more details below. About College: MGM's Jawaharlal Nehru Engineering College is an engineering college affiliated to the Dr. Babasaheb Ambedkar Technological University, Lonere, Maharashtra. It was established in 1982. The school is financed and run by the Mahatma Gandhi Mission. How to Apply: Interested and eligible candidates are requested to send CV with all copies of certificates / testimonials and recent PP size photos to the email address mentioned below. Mention the post, college and department in the subject line of email.